Some of our Independent Front Suspension systems require an aftermarket oil pan. If you are ordering one of these systems, our recommendation is our custom oil pan and oil pickup kit, which uses your stock oil dipstick. The coated steel pans are extremely well made which means great fit, every time. 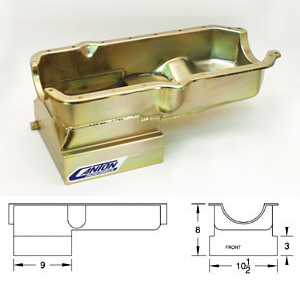 This “T” Sump oil pan is for AMC V-8 engines. It has an 8″ deep, 10-1/2″ wide, and 9″ long sump that holds 8 quarts, 9 quarts with filter. Each pan kit includes the pan with welded oil baffles, and the oil pickup kit for internal oil applications. There is an available external pickup for external oil line applications, but is not included with this kit. Installation of external pickup kit is available. There is an available external pickup for external oil line applications. There are no upgrades available for this product.